POSTED: Fri, 09/08/2017 - 17:50 | POSTED BY: Traci C.
Disney has cancelled the Saturday night performance of the Night of Joy concerts. Guests with tickets for tomorrow night can exchange them for tonight's shows. Ticket change requests can be made by calling (407) 939-7818 or email Ticket.Inquiries@DisneyWorld.com. Disney has also announced that it is not accepting any dining reservations from today through Monday, September 11. They are also waiving the normal dining cancellation policies for the same dates. Fort Wilderness Resort and Campgrounds and the Treehouse Villas at Disney's Saratoga Springs will close Saturday, September 9, at 2 p.m. This closure will also impact the Hoop-Dee-Doo Musical Revue, Trail's End, and Mickey's Backyard BBQ. The Spirit of Aloha Dinner Show at Disney's Polynesian Village Resort has been cancelled for Saturday night, and most likely on Sunday night too. Blizzard Beach is closed today and tomorrow. The Orlando area is currently under a hurricane watch and both Orlando International Airport and Orlando Sanford International Airport are suspending flights beginning Saturday at 5:15 p.m.
As of press time, Disney World was the one Orlando-area theme park that had not announced it was closing due to the impending hurricane. Universal is closing Saturday at 7 p.m. and will remain closed Sunday and Monday, Sea World is closing Saturday at 5 p.m. and will remain closed on Sunday and Monday, and Legoland will be closed Saturday through Monday. Disney's Animal Kingdom: Closing early on Saturday, September 9 at 9PM - Monday September 11. Rivers of Light for September 9th has been canceled. Disney's Hollywood Studios: Closing early on Saturday, September 9 at 7PM - Monday September 11. Fantasmic! and Star Wars: A Galactic Spectacular have been canceled for Saturday night. Epcot: Closing early on Saturday, September 9 at 9PM - Monday, September 11. There will be no IllumiNations on Saturday night. Magic Kingdom: Closing early on Saturday, September 9 at 9PM - Monday, September 11. There will be no fireworks on Saturday night. Disney Springs: Closing early on Saturday, September 9 at 9PM - Monday, September 11. Typhoon Lagoon: Closing early on Saturday, September 9 at 5PM - Monday, September 11. Blizzard Beach: Closing early on Friday, September 8 - Monday, September 11. ESPN Wide World of Sports: Closed Saturday, September 9 - Monday, September 11. Transportation Closures: Transportation from Disney's Animal Kingdom Park and Disney's Hollywood Studios Park will end at 8PM on Saturday September 9th. Disney Resort transportation from Magic Kingdom Park, Epcot, and Disney Springs will end at 10PM, September 9th. 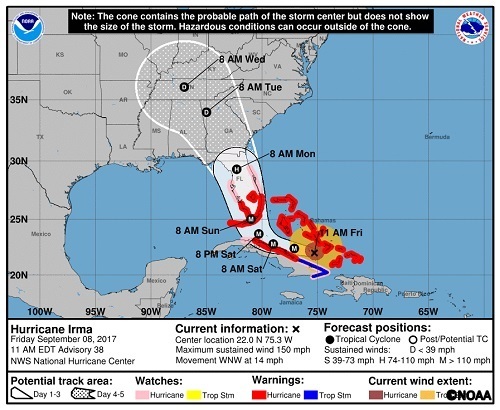 If you are in the path of Hurricane Irma, please stay safe!